In 1997, Garry Kasparov was defeated in a six-game chess match by IBM’s Deep Blue supercomputer, marking the first time that a reigning world chess champion had lost a match to a computer. While humans put up a valiant fight over the following years, it became clear by 2006 that computers are superior in evaluating a quadrillion potential moves and outcomes more quickly and effectively than even the best human chess players. This makes sense to us today. We know that computers are critical tools and superior to most humans in analyzing innumerous amounts of data and possible scenarios and in guiding us to make the most informed decisions. From our perspective as a global leader in solar, SunPower compared this evolution in the world of chess with how the solar industry typically develops utility scale solar. There are a quadrillion possible tracker layouts to consider when you’re planning a solar plant, but time and resources necessarily limit the evaluation process. Given the financial investments our customers are making in these projects, we want to be certain they’re making the most informed decisions to achieve success. How can you select the best possible design if you haven’t had the opportunity to evaluate all the possibilities? Today, SunPower is solving that issue and more with the launch of the third-generation SunPower® Oasis® power plant for utility scale solar. It takes the uncertainty out of development and design and quickly and efficiently delivers a solar power plant that achieves financial goals by optimizing site utilization, lowering costs and maximizing energy production. The new product is based on SunPower’s first-generation Oasis power plant that launched in 2010, as well as on previous iterations of tracker technology that we have been installing since 2004. As a result of this legacy product, generating more than 2.5 gigawatts of solar power at plants operating worldwide today, SunPower is in the unique position of applying a dozen years of power plant data and customer experience to develop this latest power plant technology. Our customers are overwhelmingly positive about the new Oasis power plant. Currently, we have more than 700 megawatts of third-generation Oasis power plants awarded, and we are starting construction in North America and China this year on the first solar power plants to use the new product. Beginning next year, all new solar power plants from SunPower will be constructed using the new technology. From project development through operations and maintenance (O&M), the Oasis power plant optimizes return on investment with the following features. 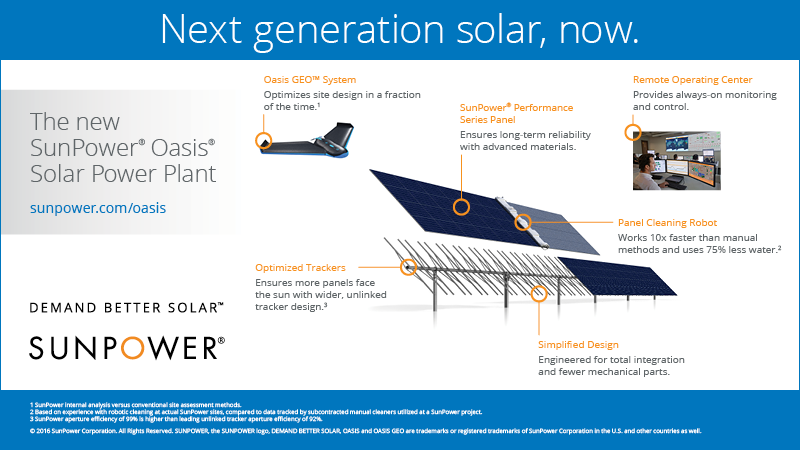 The SunPower® Oasis GEO™ system is a groundbreaking new component of the Oasis power plant that automates project design using drones and proprietary software. Drones are used to survey sites, which enables quicker and easier access to remote sites than manual survey methods and allows for faster evaluation of multiple potential sites. The data gathered by the drones is sent to the Oasis GEO software and used to generate thousands of designs for evaluation, based on customer goals such as energy yield estimates, construction cost estimates, IRR calculations and more. Developers can screen a large number of potential sites quickly using the cloud-based computing platform, and owners can be assured that projects have been fully optimized for profitability and levelized cost of energy (LCOE) versus conventional manual-based approaches to project design and development. A typical site has 1060 possible plant configurations; the Oasis GEO system explores this highly complex design space to recommend the best site layout to meet the customer goals. SunPower’s proven Oasis technology has been re-engineered to achieve more flexible site selection, more efficient site utilization and increased energy production. Oasis tracker rows are now un-ganged, or not linked, enabling each row to track the sun at the optimal angle throughout the day. Each row measures four meters wide by 45 meters long, which is twice as wide and half the length of typical un-linked trackers. The distance between rows measures six to eight meters. Oasis trackers also offer an increased range of tracking motion of approximately 60 degrees, compared to conventional trackers that are restricted to a 45-degree range of motion. Oasis plants can generate up to 60 percent more energy than conventional solar power plants. By using 16 percent more land on a site than competitive products, an 81-megawatt Oasis plant could be built at the same site on which a competitor tracker could build 50 megawatts. Oasis trackers allow for solar power plants to be constructed on lands formerly considered topographically unsuitable for plant development. Most competitors’ trackers require regularly shaped, flat sites with slopes no greater than 6 degrees. Oasis power plant can be flexibly configured to fit irregularly shaped sites and can be installed on slopes up to 10 degrees, or 17 percent, enabling more flexible site selection and optimizing site utilization. Each additional ten acres of usable space on a site represents up to two to four megawatts of power, a potential significant impact on a project’s bottom line. The distance between Oasis tracker rows is six to eight meters, wide enough to accommodate a tractor, potentially enabling sites to be used for both energy and food production. SunPower is partnering with the University of California, Davis, a global leader in agricultural studies, to study co-location of agriculture with Oasis technology, and to evaluate possible crop varieties and yield. More than half of solar power plant energy deficits come from installation faults. That’s often the result of inexperienced crews piecing together parts developed in isolation by numerous manufacturers. SunPower’s design philosophy is different; we believe that when technology is built to work together, it works better. All DC wiring is managed above ground, using pre-manufactured DC harnesses and eliminating trenching. Oasis has no combiner boxes, cable trays, motor batteries or other parts with a history of field failures. The fully-integrated design supports use of both SunPower’s high efficiency E-Series panels as well as SunPower® Performance Series (P-Series) solar panels. Both panels deliver industry-leading long-term performance and reliability while reducing system costs and land requirements. Soiling can be a leading source of potential revenue loss for solar power plant owners, and manual cleaning takes time and disrupts daytime energy production. SunPower’s robots are expected to be able to clean 10 megawatts of Oasis panels in 10 hours with three workers at night, 10 times faster than manual cleaning methods used by competitors. SunPower’s proprietary robotic panel cleaning technology used at power plants today is proven, with more than six gigawatts of panels washed to date — enough to clean a 1-meter-wide ribbon of glass from San Francisco to Dubai. This system uses 75 percent less water than manual cleaning methods. 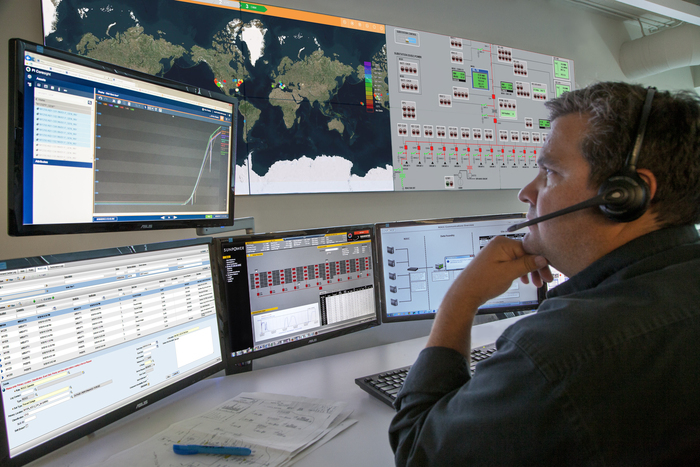 SunPower’s Remote Operations and Control Center (ROCC) offers 24/7/365 site monitoring and control, optimizing energy production to allow customers to better manage their energy. We project that the ROCC will be monitoring and controlling more than 1.8 gigawatts of solar power plants around the world by the end of 2016. The new Oasis power plant SunPower announces today represents an unprecedented integration of hardware and software for solar power plant design. It builds on the foundational success of earlier generations of Oasis, making the complex simple, and incorporating groundbreaking new features to ensure customers can make the best decisions to optimize their investments and achieve their goals. Similar to the effect that computers had on the game of chess, applying data acquisition and analysis to the design, construction and operation of solar power plants is a natural progression that enables smarter, more efficient planning and outcomes. While Kasparov surely felt the sting of his loss to his non-human competitor, we welcome the opportunity to use advanced technologies to add value for our customers and to fight against climate change. Somewhere, Deep Blue is smiling.